Instigated in conjunction with “The Locational Turn? Reflections from Chicago on documenta in Kassel, Alexandria, Banff and Kabul” panel discussion held November 13 (2013) at the Block Museum on Northwestern University. Anyone who tries to generalize about “the art world” owes you an explanation about which world they are describing. While there is undoubtedly overlap between major institutions, mid-sized institutions, high-end commercial galleries, universities, art schools, community colleges, apprenticeships, auctions, internships, craft galleries, non-profit galleries, informal and community-based cultural centers,Â residency programs, private philanthropists, collectors, public grants, magazines, theoretical journals, blogs, public art commissions, street art, artist collectives and individual artists – they can still seem worlds apart. One world that can seem worlds apart is that of the Documenta exhibition, founded in 1955 by Arnold Bode, to occur every 5 years and reconnect post-war Germany to the contemporary art conversations and practices developing internationally. Produced by the documenta and Fridericianum Museum Event Company which provide the ongoing organizational infrastructure to keep the project going, the exhibition is largely guided by a curator. This position is akin to “being the mayor of a small city,” according to Michael Rakowitz, a Chicago artist exhibiting in this years show (1). 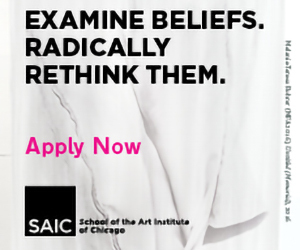 In 2008 the search committee arrived on Carolyn Christov-Bakargiev as the curator, and she began her work on January 1st, 2009 re-inventing what has become over the last 13 incarnations, a crucial node in the intellectual and critical discourse of art around the world – itself producing conversations, catalyzing careers, and generally generating trends that will be talked about in years to come (in Chicago over the last year at the MCA, SAICâ€™s Sullivan Galleries and U of Câ€™s Logan Center Exhibitions there have already been three exhibits of re-worked pieces shown at documenta13). In the summer for 100 days, from June 9th to September 16th of 2012, over 300 artists, writers, and thinkers participated in documenta13 in Kassel, Germany. In 2012 a remarkable number of Chicago artists were invited as participants. Theaster Gates (with John Preus and Rebuild Foundation), Claire Pentecost, Michael Rakowitz, and Lori Waxman are all exhibiting works. A number of Chicago-based authors produced texts for the 100 Days 100 Books portion of the programs including Brian Holmes, WJT Mitchell, David Nirenberg and Jane Taylor. To have this many participants from one city would be unusual, but for it to be a city so detached from the commercial facets of art selling (gallerists, collectors, auction houses, etc) and so oriented towards political, community, and socially-engaged art is what makes the decision stand out. Locally there has been a thriving art community in Chicago that is focused on strong social bonds, engagement with concerns and disciplines that exceed the focus of art, and political and ethical commitments around themes ranging from war and labor to housing and food. This has a long history in the city, dating back to the 1960s in terms of direct lineages with existing practices. It has developed in a particular and regionally-specific way, while art since the 1980s more generally in the United States has experienced a gradual engagement with political and social life. 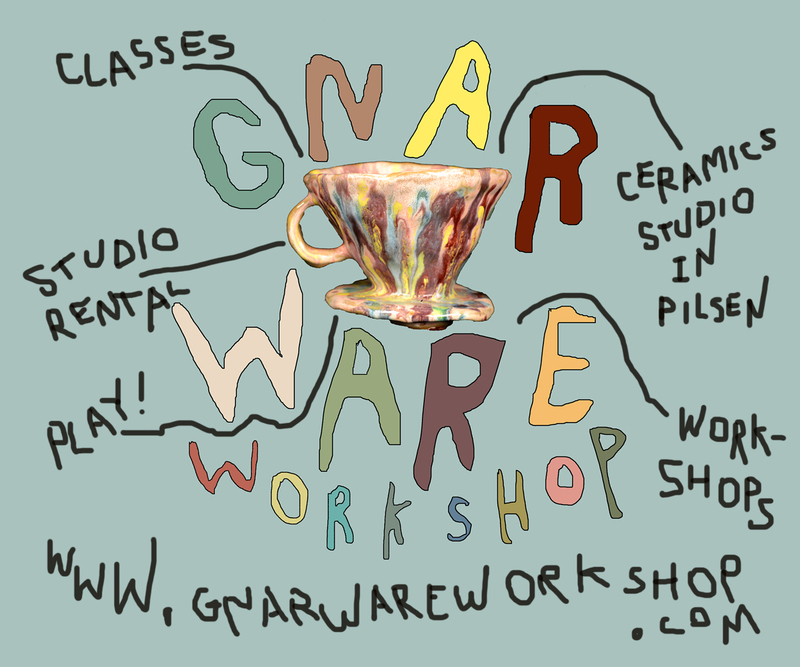 All over the country, but particularly on the coasts, there are art schools and universities initiating “Social Practice” focus areas for students interested in art that deals with social forms as a material in place of traditional art materials and mediums that have come to include clay, video, performance, paint, photography, sculpture, murals, and interactive websites, among many others. Deeply familiar with the Chicago artists and authors participating in documenta13, I traveled to Kassel last summer to see their work and consider my hometown art scene in relationship to this massive global event. Below are a few scenes from that trip. Lori Waxman, Photo by Nils Klinger, Courtesy of Documenta (2012). Jorg Doerig’s friends and family have joined him to go have his art critiqued. They pack into a small self-contained room, a sleek writers cottage of sorts, where Jorg unpacks his paintings of flowers, and a self portrait, and layes them out on some shelves and leaning against the wall along the floor. It was time for his appointment with the Chicago Tribune art critic and art historian Lori Waxman, who had been taking half-hour appointments with local artists in Kassel three days a week all summer. Over the visit she asks some questions, but mainly gives her attention to interpretation of the art. “Why Paint?,” she writes in response to Jorg’s work. “For love of certain subjects.” She concludes. To watch her type (a mirror of her laptop monitor is displayed on a screen facing the artist and a steady-stream of passer-bys) is akin to watching a live poetry reading. Nothing else can compare to the experience of watching someone invest herself in the creative practice of another. While art criticism has become a game so detached from the making and the maker, Waxman reinvests herself in people and their artistic output. And she herself is on display, revealing the writing process, her process. Most artists Waxman critiques in this project, titled “60 WRD/MIN Art Critic,” have never had their art written about. For the most part she has executed this project in smaller towns throughout the United States with the support of a writers grant from the Andy Warhol Foundation. In these settings, her presence incites tremendous excitement. She consults an online thesaurus. What is a synonym for “Lovingly”? Jorg stirs, he smiles and looks around at his friends. What a strange experience, to have someone craft language before your eyes about your heartfelt and time-consuming creative activities. Michael Rakowitzl, Photo by Roman Maerz, Courtesy of Documenta (2012). In “What Dust Will Rise?” Michael Rakowitz presents an entire room of enclosed vitrines and display tables immediately conjuring the space of a museum, a special collection or an archive. Upon closer look, you notice handwritten notes in thin black marker ink on the glass panes of the display shelving. Like many artists in this installment of documenta, Rakowitz engages in the legacy of the Nazi presence in Germany and in the present military operations and occupation of Afghanistan. The building in which his installation is presented, the Fridericianum, was a library when it was bombed in 1941 and all but 15% of the books were destroyed. The artist elegantly draws a parallel between that sited history, infusing it in the present, with the interrelated history of Taliban destruction of cultural artifacts in Afghanistan – most notably the Buddha statues in Bamiyan. Presented on the tables I encounter replicas of books destroyed in that bombing, carved out of stone quarried in Bamiyan by artisans Rakowitz commissioned in Italy. Proceeding through the space, books from other bombings, fires, and cultural assassination appear. 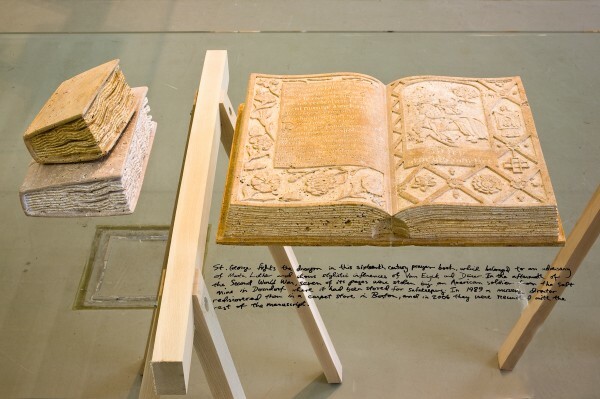 Many of the books were original printings with intricate woven and printed cover art, shown here in rich three dimensional carvings of the cover, spine, and worn pages – all beautifully carved with precise details. Other books take the form of an open spread, drawing attention to the content through subtle and surprising connections with the form or the act of destruction that inspired the installation. Others, like the oldest lexicon of classical medieval abbreviations, are just devastating because of what they contain, and what knowledge and culture was lost. Surprise is the crucial word for this experience. As I proceed from case to case and book to book, I keep thinking that I have comprehended the scope of the artistic gesture. And then the next object or collection startles me.Â He did what? I think. He really brought some building fragments from dismantled public housing in St. Louis, the Twin Towers, and the Berlin Wall? Yes. Stone carving chisels from Bamiyan made from the remnants of exploded cars and abandoned tanks belonging to the occupying forces? Yes. Surprise after wonderful surprise, the installation unfolds with linkages and nuances that dispel an attempt at easy summary, but provoke curiosity in an unwritten narrative about our ongoing human projects of creation and destruction, war, imperialism, pre-modern and modern. A highlight of the exhibition, this surprise echoes the best parts of documenta13, an exhibit without an overarching theme – forcing each work to be viewed for what it is. Claire Pentecost, Photo by Anders Sune Berg, Courtesy of Documenta (2012). Entering from the garden into the narrow glass doors on the side of the Ottoneum, I am excited to see the work of Claire Pentecost in such an ideal location. Prominently and symbolically located in the the first theater built in Germany, now serving as the Museum of Natural History, theÂ installation is the entrypoint for an entire building full of works about seeds, science and ecology – one of the most coherent sub-themes within this massive and themeless exhibition. Pentecost produced this work in residence at The University of Kassel Faculty of Organic Agricultural Science in Witzenhausen and following her participation in a soil workshop at the Rodale Institute in Pennsylvania. The outcome is a multi-modal installation all centered around a proposed currency called Soil-Erg. She made dozens of drawings with pencil and mud, illustrating a heterogeneous paper money version of Soil-Erg, each depicting a different ecological scene or significant activist and research figures working with food and science. Above the two walls of paper currency, are differently sized medallions of soil. The elaborate tables at the center of the room are piled up with ingots of soil, reminiscent of fantastical gold stashes from Indiana Jones or Fort Knox. Along the back wall is an intervention into the museum’s collection – a move made by a number of artists who found inspiration in the specificity of the temporary exhibition venues. On the left there is a glass display unit from the collection of the Otteneum that shows slices of soil from different depths of the earths crust. To the right, Pentecost fabricated a similar companion unit that serves as a compost pile that will accumulate over time. The insides are equipped with microphones and through use of a headset you can literally hear the energy, heat and process of the decomposition of organic waste. On one wall of the unit, a hand-written chart depicts the phenomenon of corporate land-grabbing in the global south where North American and European companies are buying up massive farm land and even creating “soil farms” throughout Africa and Latin America. Pentecost’s participation in documenta13 is itself heterogeneous. She is one of the few exhibiting artists who also made a book for the 100 Books 100 Days project, she gave a number of lectures and workshops, made a video for the website dealing with the importance of seeds to culture, and was an instructor at the summer retreat on the theme of “retreat” at the Banff artists residency in Canada. Theaster Gates, Photo by Nils Klinger, Courtesy of Documenta (2012). 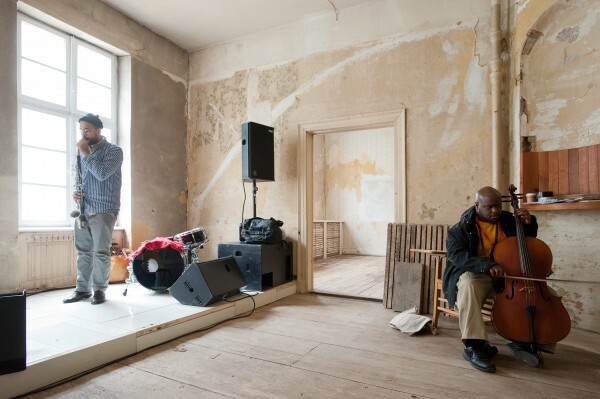 The immersive “12 Ballads For Huguenot House” is spearheaded by Theaster Gates along with his design collaborator John Preus, studio manager Theo Boggs, and a rotating cast of staff from his non-profit Rebuild Foundation. Walking into the house,Â I immediately feel a complex social energy. People buzzing around, up and down the stairs, posting schedules for the day’s activities and consulting with one another about what the morning has in store. The video and audio pieces scattered throughout the 2nd and 3rd floors of the building are still being switched on, and some people just waking from bed.Â Art tourist’s are poking their heads into the sleeping quarters, asking the people clearly in bed, “do you sleep here”? The Huguenot House is undoubtedly alive with real humans and the art pieces themselves were just a small component of the overall project. It may have one artist’s name attributed to it, but something this alive is the work of many. Mobilizing people to invest in places and buildings is one of Gates’ strengths. The building at 25 Friedrichsstrasse in Kassel had been empty since World War 2. Under very different historical forces, there are homes in Gates’ neighborhood in Chicago, Grand Crossing, that have also been abandoned for decades (though not quite as long as in Germany). 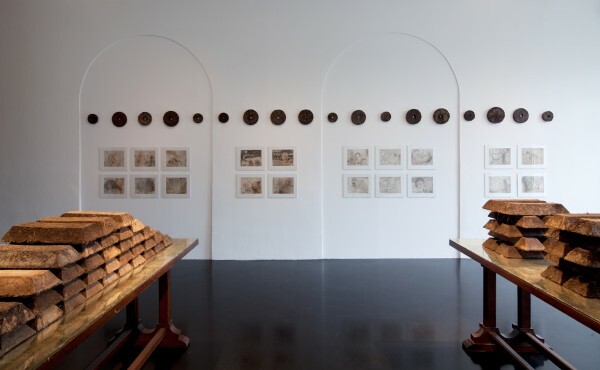 As a crucial facet of his participation in documenta13, a deal was made where a house in Chicago would be purchased and its wooden and metal guts would be converted into objects to repopulate the building in Kassel and at a later date visa versa, forming a kind of architectural material exchange. This insistence that elite cultural institutions should subsidize projects in the places where he lives and works (which has now grown to include a number of Black communities throughout the midwest through the work of Rebuild Foundation) is something Gates unabashedly names in his public presentations. And in the case of Hugenot House, this subsidy to Chicago cultural possibilities that lie in the future of that local project, have been reciprocated with real life-force being breathed back into the long abandoned building. Throughout documenta, it has been the site of performances, daily yoga classes, community meals and what are said to be the best parties in Kassel every Wednesday night throughout the four months of the exhibition. Conclusion: The Rematerialization of the Art Object? As Paul Chan, another participating artist with Chicago ties, commented in a recent interview during documenta, “It is a funny time in art when making something quiet is seen as radical.”(3) The expectation has been implicitly fostered through curation and critical writing that new art needs to be participatory. It is not dissimilar from trends in governance and commerce – participation is the key to the hearts and minds! As a counterpoint to this trend, these four projects start from complex social problems and engaged in the social processes necessary to activate and engage those problems, and then they made art objects and forms. Finding material resolutions to distill the complexity of the world into a form is one of the contributions artists have historically made to the societies in which they live. The work presented at documenta13 by Chicago artists produces a productive challenge for the debates around socially-engaged art practice and its treatment in educational and art presenting institutions. Formalist reactionaries now commonly antagonize participatory art with the same odium as was applied to performance artists in the decades past while Social Practice fundamentalists claim that objects are dead and process is the new vanguard. Perhaps these artists show a third way, a marriage between the qualities artists have long attempted to capture with material forms and the complex social processes necessary to engage the complex social world in a meaningful way.